Has your WordPress website slowed to a crawl? A slow site means high bounce rate and a big hit to your search rankings, so it’s important to fix this and optimize your WordPress site right away. This guide has a few ideas, great for those who’ve noticed a decline in speed as well as those beginning development. There are all sorts of things you can do to make your website faster, many of them are simple fixes. But if you’ve noticed a sudden increase in loading times, you probably have a specific issue, and identifying it can be difficult. Follow these tips and you should be able to narrow it down. Always do your research. Do customers complain about slow speeds, downtime, or other issues? Using an independent third-party source, how does their speed stack up? Slow loading times can often be traced back to the web host. Does it have a CDN? SSDs? Fast processors and abundant memory? If not, it may be time to upgrade. Sometimes it’s not your host’s fault; it may be your plan. Perhaps your shared hosting partners are taken up too much space, or you may have outgrown shared hosting entirely. Time to move on to VPS! The second common cause of a slow WordPress site is the theme. A theme that makes a lot of queries and is bogged down with images can cause a huge strain on the server. If you’re good with code, then you could try optimizing the theme yourself, or cut out unnecessary images. Otherwise, go with that less cool but more lightweight theme — especially if you’re on shared hosting. Still too slow? What about your plugins? You should always research a plugin before you install it; some are known to have un-optimized code. You can disable and re-enable plugins one-by-one until you identify the culprit. And if you can eliminate any of them, do so. Images are one of the worst offenders for slow websites. Before uploading, resize them if they’re very large and use an image optimizer like Optimizilla to reduce file size. One trick is to host the images elsewhere. There are free and paid image hosting websites. Make sure to read the guidelines first, as some, like Imgur, require you to purchase a license for this purpose. For smaller graphics like buttons and headers, try using CSS sprites to place them all in one image. Enable Gzip compression. This will transfer a compressed version of the website to visitors, which is then unzipped, decreasing loading time. This can be found in the WordPress admin options menu, or in cPanel if your host offers it. Also, go to Settings > Discussion and disable pingbacks and trackbacks, a tool spammers often use to flood you with thousands of notifications. This isn’t a quick fix, but it’s great in the long-term. Plugins are probably the best ways to automate tasks. 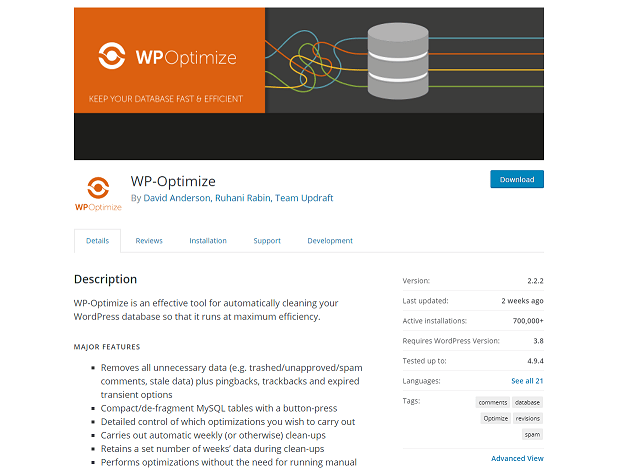 Why manually delete drafts, revisions, spam comments, and trash files when you can use WP-Optimize? WP-DBManager also makes database optimization easier. There are many plugins out there that can help you reduce loading times. Also try a caching plugin like W3 Total Cache, or Autoptimize to minify your site. Just do your research. Don’t download 50 optimization plugins; make sure they’re not obsolete or conflicting. Loading time is the first thing a visitor will notice, so optimization should be your first priority. Now you should know how to speed up your website, and where to look if things suddenly slow to a crawl. Your rankings will go up, and bounce rate should go down! In what ways do you optimize your WordPress site? Please share your ideas below. And feel free to connect with us on Facebook and Twitter for more tips and tricks.